Most people know little to nothing about mental illness. Ask 10 lay people the difference between psychosis and neurosis and just one or two would be able to give you the right answer. We are better educated about physical health. Nearly everyone knows the difference between heart disease and cancer or diabetes and chronic bowel syndrome. But there are two types of mental illness that most people think they understand but don’t. I’m talking about depression and anxiety. Before I suffered from clinical depression and anxiety, I believed I understood those terms. Depression was feeling really bad about something. Anxiety was worrying about things you probably shouldn’t. I thought of them not as mental illnesses but as mental weaknesses. Depression was caused primarily by paying too much attention to oneself and one’s problems. The solution, therefore, was to pay attention to other things. Anxiety was fearing things you shouldn’t. So, my solution was exposure therapy. I felt this way most of my life. But about five years ago, I experienced anxiety and depression at a rather severe level. And that made me understand that there is a difference between the natural depression and anxiety we feel when our brains are “healthy” and the deep depression and panic-level anxiety we feel when they are not. Clinical (or deep) depression is a neurological malady, not mental weaknesses. It may may be triggered by thoughts or memories or feelings, but the extreme pain you experience is the result of what is happening in the brain. My bouts of deep depression sometimes came out of the blue, without triggers. I had no troubles, and nothing to worry about. Everything was fine. The thoughts that occasionally triggered a deep descent had no effect whatsoever on me when I was not in a deep depression. I endured my first several bouts of depression without telling anyone, staying in bed for days and pretending I was physically sick. I did that because I believed my severely negative thoughts and feelings were caused by a weakness of my mind. But recently I decided I would tell my wife what was going on and found that to be helpful. She no longer had to wonder why I spent so much time in bed or brooding when it didn’t appear I was physically sick. Since then, I’ve come out of the closet to an increasingly wider group of people and I feel good about that, too. I’ve also decided to treat my depression like the illness it is. Several months ago, I started working with a psychiatrist and a psychologist to create a therapy regimen that has been very helpful in healing me. The first step was keeping a detailed daily journal of not just my thoughts and feelings, but of everything I did—namely in the realm of eating, sleeping, smoking, drinking caffeine, and medications—so I could have a better understanding of what worked and what didn’t. By reviewing the journal over a two-month period, I was able to create a 10-point ranking system that ranked the “level” of my mental health. Level one represented extreme pain and the nearly total inability to function. Level 10 represented euphoria. There have been three distinct aspects of my experience of deep depression: how I think, how I feel, and how I function. Each changes, to some degree, depending on levels. At the lowest levels, for example, my thinking was extremely limited, dark, and repetitive. I couldn’t engage in meaningful conversation because I couldn’t process information. And I was in extreme emotional pain. At the upper levels, I could think clearly, feel motivated, and was sometimes even overly ambitious. I was fully functional. I never stayed at the same level all day. There was some fluctuation, but it was rarely more than 2 points. There were things I could do (or ingest) that seemed to bring me up, but most of the time, I could go up only one level during a four to six hour period. I was never able to go up more than 2 points in a single day. Healthy people normally spend their days ranging from 7 to 9. A really bad day might be a 5 for me. Since most people have never experienced a below-5 day, they don’t know what it’s like. Most healthy people, when they read the ranking system for the first time, say that they have been down in the 3s and 4s. But if you ask them questions about functionality, you can help them understand that they weren’t. The remedies that work at one level do not necessarily work on other levels. I’ve found, for example, that I cannot meditate when I’m below 5. As I mentioned earlier, sharing that list with my close friends, colleagues, and family members was very helpful; it made it easy for me to communicate my incapacities by telling them what level I was at. Many people, including my psychologist, found the list to be helpful as a tool for other people that suffer from deep depression. 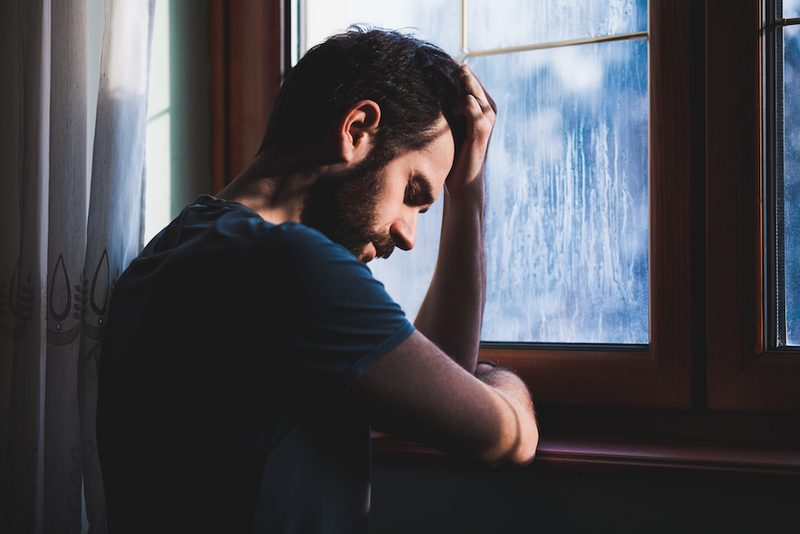 Because it’s been helpful, I decided to share it with the readers of Independent Healing because, statistically speaking, there are thousands of readers who suffer from deep depression and anxiety. Take a look at this list. Afterwards, review the list of things I’ve discovered about trying to get healthy again. It should be insightful. 1: (Triple Black): This is the stage just before suicide. I don’t know this stage but I imagine this: you are physically exhausted, in severe mental pain, and have no hope that you will recover. You welcome death. And you take it. 3: (Black): You are deeply depressed and physically weak. You wake up tired. You don’t want to get out of bed, but you can. You can move around the house but you want to be alone and dread social interaction. Your mind is riddled with dark thoughts and feelings. You want to be alone. If you are forced to work or socialize, you cannot do so. You cannot read. You cannot write. You find it difficult to look others in the eye. You cannot answer questions because you cannot process language fluently. It is obvious to anyone who sees you that something is seriously wrong with you. You can engage in some limited mechanical activities like driving or playing solitaire, but you cannot play games that require thinking such as chess, poker, or bridge. One day feels like a week of suffering. You look forward to going to bed and sleeping. 4: (Dark gray): You are depressed but you have moderate physical energy. You wake up feeling gloomy and tired and your mood does not improve, regardless of what you do. You feel anxious and sad. Problems seem insurmountable. Challenges are frightening. Your mind keeps gravitating towards dark thoughts and feelings. You cannot plan ahead because the very thought of doing almost anything makes you anxious. You can function but at a rudimentary level. You cannot do anything complex or challenging. You dread socializing and if you do, you can only operate at a minimal level because the constant dark thoughts and feelings in your head make it impossible. You find it difficult to watch television and read. 5: (Gray): You wake up feeling low but not terrible. Throughout the day, you feel a discernible undercurrent of sadness/anxiety that may translate into a feeling of “I don’t care about anything.” And it can last all day. Yet you can function at a moderate level. You can do most work but you don’t care about it and you’d rather be in bed. If your work is solitary, like writing, you may find that your mood will rise a level simply by working. If your work requires you to interact with others, you can “fake” normalcy, but your performance will be mediocre. You recognize that you feel considerably better than you did at levels 3 and 4, but you worry you will drop back there. By putting on a game face you can convey normality to most people. You can watch television and you can read. 6: (Light gray): You wake up with a fair amount of energy. But you are not happy. There is a faint disturbance in the background of your mind. It may feel like sadness or anxiety—or both. But you are not afraid of what you have to do or whom you have to meet. You can function normally, including participating in work or social situations. For healthy people, this is what feeling gloomy feels like. Because you have been much lower, you are hopeful and fearful at the same time. You are hopeful that any number of activities and/or therapies could bring your level to a 7 or an 8. But you are fearful that something could bring you down to a 5 or lower. You are sensitive to how you affect other people’s emotional states; you don’t want to disturb them. 8: (Sky Blue): You wake up energized and eager to get on with the day. You are happy to work and can work productively. You enjoy being social and look forward to pleasant social situations. You find all sorts of things to be interesting and are willing to take on new responsibilities and feel relatively optimistic about your future. This is the level healthy people think of as “good,” as in, “I feel good.” For you, this level is rare and precious. 9: (Sky Blue): You feel great—physically and mentally. You think, literally, “It’s so good to be alive!” You want to do more of everything in your life—work, hobbies, sporting activities, social engagements, etc. You feel confident you can succeed at everything and that good things will come to you. You have no worries or doubts. You can be unwittingly insensitive to others at this level or you can be considerate and caring. You feel great. 10: (Fire White): You are euphoric. On cloud nine. If there is a heaven, this is what it must feel like. You can’t do anything because you are dancing around, telling others how wonderful you feel. This stage generally doesn’t last. 1: You are in extreme pain and have no hope. You commit suicide. 2: You are in extreme pain and cannot get out of bed. 3: You are in pain and can be mobile but cannot think coherently or communicate. 4. You are depressed but can do simple work and converse minimally. It is obvious to others that something is wrong with you. 5. You are sad but can function at moderate levels, and can “fake normality” but your performance is mediocre. You can read and watch television. 6. You feel “okay” and can function normally. 7. You feel “good” and can function well. 8. You feel “happy” and are eager to make plans and take on new challenges. 9. You feel “great”—almost invincible. You are eager to take on all challenges. 10. You are euphoric, and therefore, unable to focus on getting things done. You are dysfunctional. As I mentioned earlier, each level has its distinct patterns and intensity of feelings, thoughts, and functionality. Below 4, for example, thoughts are merely the repetition of one or a handful of negative thoughts. Feelings border on extreme pain and functionality is nearly zero. From 4 to 6, you can think, but not well because your emotions interfere. You are fearful. You feel vulnerable. You are anxious. 7 is a neutral state where you can think find and have almost no noticeable emotions and can function fully. Oddly enough, the prime level for being in the here and now is not 9 or 10—or even 8. It’s 7. That may seem odd until you realize that 7 is the level where you feel fine and open to anything but have no strong emotions, either positive or negative. It’s the Zen zone—and Zen is how you get rid of fear and desire.